« The Stepford Dress Code: There is None. Midterm Elections are here! And though we are sure rooting for our husbands’ party. 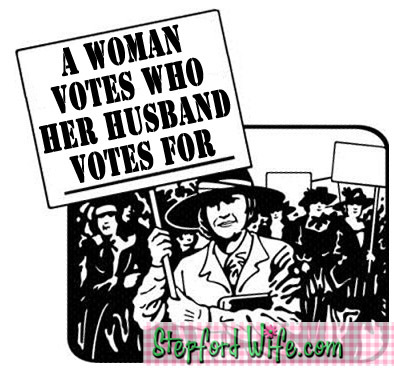 We girls admire what women suffragists did for pushing for a woman’s right to vote. However we feel that we are mostly not smart enough to take the entire political picture into consideration. The world of men and the business of running a country is really too confusing for us. The rest of the husbands just tell us to stay at home. They say those flashing lights and buttons are too complicated for us to work. This entry was posted on Monday, November 1st, 2010 at 1:30 am	and is filed under Current Events. You can follow any responses to this entry through the RSS 2.0 feed. You can leave a response, or trackback from your own site.